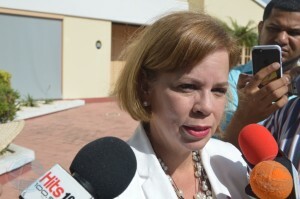 THE HAGUE - Aruba Prime Minister Evelyn Wever-Croes is not planning to take back her words to the Dutch newspaper NRC about being misinterpreted in a recent article. Wever-Croes informed the media on Wednesday that she took note of an email from NRC in which she was asked to retract her reaction to the article in which she denied having said that the Dutch government had an “indifferent and irritating” attitude where it pertained to the Venezuelan refugees coming to Aruba. She also denied ever having said that she had been invited to attend a meeting between Dutch Minister of Foreign Affairs Stef Blok and Venezuela authorities. She made clear that she would not publicly rectify her words in response to the newspaper article and that her lawyer would contact the NRC. In a press statement, Wever-Croes said that Aruba was facing great challenges and that she could not and would not dedicate any more attention to this discussion between her and the NRC. “Aruba will tackle these challenges with much vigour and does not wish to be involved in internal Dutch politics,” she stated. The NRC editor-in-chief’s office sent a letter to the Prime Minister on Tuesday after Wever-Croes told different media that the newspaper had misquoted her. The NRC called it “damaging and irresponsible” that the Prime Minister was backing out in this manner. According to the NRC, the journalist’s notes clearly indicated that Wever-Croes had made these statements in the interview. “Apparently you were startled by the impact of your words. That is understandable, but you cannot solve that by falsely accusing us of untrustworthy reporting. We request you to retract your statement that the NRC has misquoted you immediately and publicly,” the NRC deputy editor-in-chief Elske Schouten stated. The Aruba government took a first big step towards tackling the country’s immense financial problems when on Tuesday the Aruba Parliament approved the implementation of a 2.5 per cent crisis levy per July 1, 2018. A Financial Memorandum has been drafted that contains several measures to reduce cost and increase revenue, and to get the budget back in balance in two years. In the adapted 2018 budget, the personnel and operational costs of the Aruba ministers have been greatly reduced. Wever-Croes is setting the right example by working with a minimum staff, which she said was about one-tenth of the number that her predecessor Mike Eman had working for him. In general, personnel cost has been reduced by six million Aruban florins and a plan is almost ready to structurally decrease these expenses. The government has also cut travel expenses and the cost of PR and promotion. The government wants to invest more in the social crisis plan. Wever-Croes is determined to solve the financial problems internally, without outside help. “The supervision by Parliament failed, the financial supervision failed. This government will take care of getting its finances in order on its own. We don’t need help of the Netherlands to do that. We can do it ourselves. We will bring the budget in balance and repay the national debt. The only thing we need is some time. We need time and room to get the budget sustainably balanced in two years,” she said.